Almost all of us in the IT sector remember what it was like at the beginning. We’ve all once been the fresh faced rookie programmer, filled to the brim with an almost infectious zeal, out to revolutionise the binary world of 0 and 1. It is only when we get caught up in the flurry of opportunities before us do we realize that it is dreadfully easy to lose the way. However, with some careful decision making, perseverance, and of course, paying heed to what the people with experience have to say, it is possible to mold yourself into the programmer you’ve always wanted to be. Such were the insights from SELISE CTO Shah Ali Newaj at a recent IT seminar hosted by BASIS student’s forum, in collaboration with Robi Telecom. 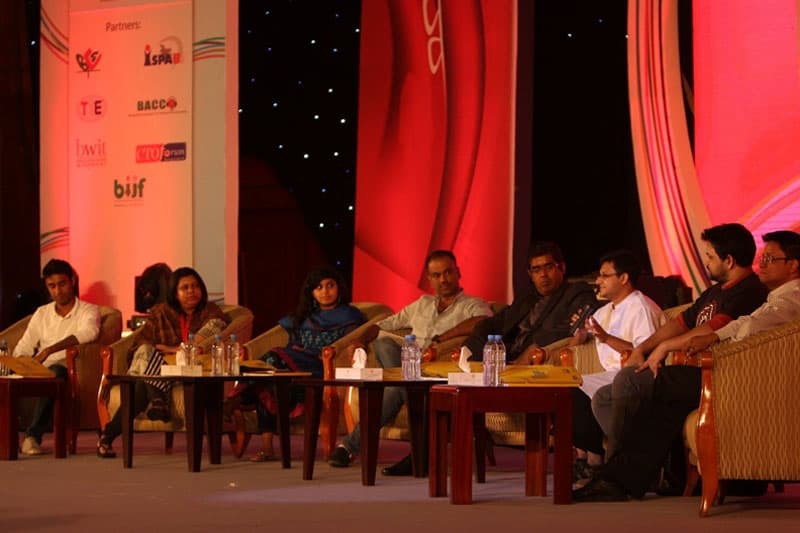 The seminar, titled ‘IT Career: Stepping Into The Future’, was held on the final day of Digital World 2015, the largest IT conference in Bangladesh. The seminar was moderated by Russell T. Ahmed, Senior VP of BASIS and panel members besides the SELISE CTO included notable professionals from the IT sector in Bangladesh. While topics of discussion at the seminar encompassed a range of topics related to the IT industry, Shah Ali Newaj focused on the dos and don’ts for those looking to build a career in the industry. According to Mr. Newaj, newbies to the industry are faced with probably the most important choice of their careers at the very onset, a decision which will effectively create ripples throughout the rest of their work life. It is very important for the aspiring programmer to join a company that fosters creativity, and bases its activities on the tenet of perpetual improvement. The best companies are the ones that encourage out-of-the-box thinking, strive for innovative solutions, but also make sure to keep up with the times and embrace new technologies that will gradually phase out older systems. It is also imperative to have a good mentor to teach the newcomer the ropes of the job and help the latter to learn and grow within the job. However, choosing the right company is only the beginning of a steep climb. The programmer’s job has its perks, but it doesn’t come without its fair share of struggles. To begin with, a professional can only perform as well as he allows himself to. This is where passion for work comes into play. New entrants to the industry must make sure that they prioritise their work above all else, and relentlessly endeavour to stay ahead of the curve. The pursuit of excellence demands that the programmer constantly improves his skills, and in the process runs the extra mile in the learning spree. According to Mr. Newaj, programmers must put in at least 2000 hours per year into coding for the first 3 to 4 years of their careers. This can be thought of as a warm up session before the software developer takes on the top flight. Mr. Newaj himself has written over 350000 lines of code in the process of creating an operating system! The programmer must also make it a point not to restrain himself, and should not be afraid to ask questions. Developing skills in the IT industry involves a great deal of interaction with all interest groups, IT professionals and laymen alike. It is highly recommended that the developer maintains strong ties to online audiences, via personal blogs and online forums. Such interaction has the advantage of allowing didactic communication, as knowledge is shared from both sides, providing all participants valuable insights. Keeping all this in mind, being an IT professional does not just mean a marriage to computers and the binary world. Like all good professionals, the developer must not let his work stunt the growth of his interpersonal skills. Becoming better at communicating with others means the developer is able to share his knowledge and also learn new things in the process. The astute professional hones his leadership skills on the way, becoming more internally driven and honing his ability to help others maximise their potential. Only through constant interaction would he be able to discover his/ her own shortcomings and work on rectifying them. Bangladesh is brimming with potential in the IT sector, with numerous new entrants to the industry every year, be it budding professionals or entrepreneurs. The industry has experienced exponential growth in recent years, and it is thus now more important for newbies to have a clear sense of direction to avoid confusion. It is thus heartening that veterans like Mr. Shah Ali Newaj have shared their experiences and insights with the rest of the industry, inspiring the rest to strive for the heights they themselves have reached, and hence, create their own indelible impressions on the industry.